It would be refreshing to start this article with “in a surprising verdict by the jury,” but this is the United States, Mr. Lee is not of European descent, and the murderer was a thug cop. A 12-member federal jury, which Minneapolis community leaders said were “all white,” deliberated for six hours today in the U.S. District Court in Minneapolis, to clear Minneapolis cop Jason Anderson Andersen and the City of Minneapolis of using excessive force. The city and Andersen will not pay damages to the Lee family. A Hennepin County grand jury cleared Andersen of any criminal wrongdoing back in 2007. The story Minneapolis police chief Tim Dolan has been feeding the public has changed several times since Mr. Lee was murdered. Though it is clear from video evidence that Mr. Lee was not armed, Minneapolis police said he was. The cops also used the proverbial “we feared for our lives” excuse that all cops in the USA use so they can appear as heroes and gain sympathy from judges, juries and copsuckers who already view badged gangsters as superheroes. There are two facts that can be concluded from this video: Fong Lee clearly did not have a gun, and Andersen clearly did. He murdered Fong Lee. The alleged gun Mr. Lee allegedly pointed at Andersen is obviously a poorly-executed fabrication by Minneapolis PD. Though Andersen and another cop, Craig Benz, said in their police report that Lee “pointed a gun” in their direction, and that Lee “was holding a gun in his right hand,” no fingerprints were ever found on the gun they obviously planted. But wait…the cops’ story gets better. In response to a motion for summary judgement filed by the Minneapolis PD in the wrongful death case, another attorney for the Lee family, Richard Hechter, filed an affidavit in March which completely debunks the cops’ story. The .38 caliber Russian pistol the cops maintain Mr. Lee pointed at them, was already in possession of the police department following a 2004 arrest of two men who had stolen the Russian pistol from one Mr. Dang Her, whom the gun is registered to. Coincidentally or otherwise, the first cop to arrive at the scene of Mr. Lee’s murder was the same cop who investigated the theft of Mr. Her’s gun back in 2004. The Lee family, witnesses, and community members know police planted this gun at the scene of the crime to cover their malice, negligence, and thuggery. Hmong Americans originally come from mountaineous areas in southeast Asia, particularly Vietnam, Laos, Thailand, and southern China. After the VIetnam War, the Refugee Assistance Acts of 1975 and 1980 granted thousand of Hmong refugees asylum in the United States after the Fall of Saigon. Many settled in California, Wisconsin, and Minnesota. Minneapolis has one of the highest concentrations of Hmong Americans in the country. Though all thug cops are rewarded with paid vacations (their best P.A.L. 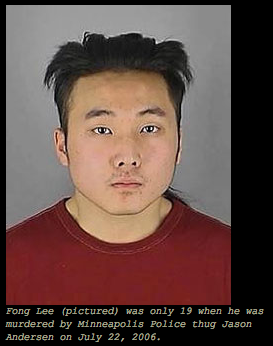 – paid administrative leave) for murdering unarmed U.S. citizens, the City of Minneapolis took it a step further with Andersen, awarding him a metal of valor in July of 2008 for his “bravery” in murdering Mr. Lee. Dolan summed this case up best with this quote: “The allegations were basically about how law enforcement does business throughout this country and what we feel is reasonable and fair.” Yes, you’re in the business of organized crime protected by “qualified immunity” and you feel it is reasonable to murder unarmed American citizens. Our thoughts and prayers are with the Lee family. We hope you continue your fight for justice. Cops, prosecutors, and judges can destroy Americans’ life in a matter of seconds, but it takes years to fix; that is IF it can even be fixed. Dolan, Andersen, and the rest of the thugs involved in this disgusting murder and subsequent cover-up will get what they deserve. The Lee family will then get the justice they deserve. This entry was posted in U.S. and World News and tagged Fong Lee, Jason Andersen, Minneapolis Police on May 28, 2009 by admin. This isn’t the only time Minneapolis has passed out medals to idiot cops.